Obsessed with Scrapbooking: [Video]How to Make a Fancy Double Slider Card! [Video]How to Make a Fancy Double Slider Card! It's a throwback for this Thursday's post and all about making your own double slider card! Since I love buildings (it's the civil engineer in me, LOL! ), I wanted to put a building on the front of a card. This card is 3.75" x 5.5" and will easily fit into an A2 envelope. Since the card is a little bulky, it's good there is some extra room available! The house is building2 on the Cricut Winter Woodland cartridge (NOT a 3-d building) and is cut at 4", with all layers, shadow and blackout. The card is layered with the Basic Grey Thin Ice Paper cut at 3.5"x5.5", white glitter paper at 3.25"x 5.25", then pink cardstock at 3 1/8"x5", then the blue swirls at 3"x4.5". 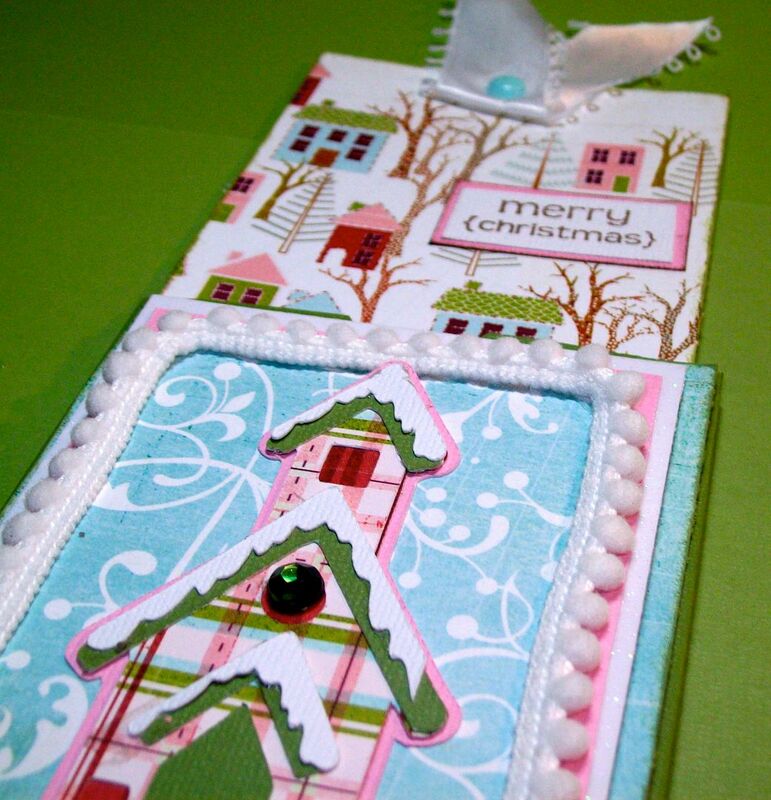 The two slider pieces are cut at 3.5"x5.5" and the top piece is accented with a "Merry Christmas" stamp outlined with pink Core'dinations paper. The bottom slider piece can be stamped, written on, etc. to personalize the card. Below, the card has been completely slid open! So, how do you make this card? Conveniently, I have made a short video showing you! See below for the video OR click HERE if you are unable to view it! 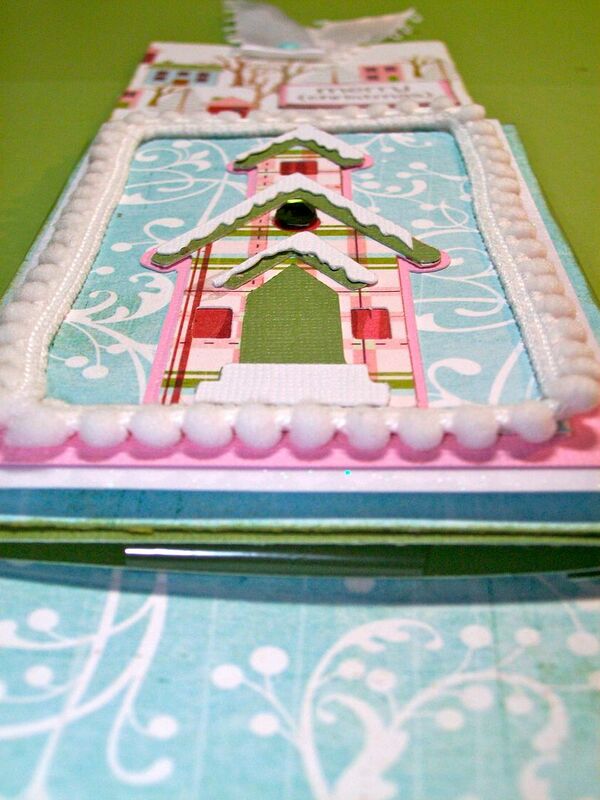 This week's giveaway: Anna Griffin Winter Wonderland Cricut Cartridge! 1) Leave a comment below - Did you know how to make a double slider card before? Do you like making moving cards? 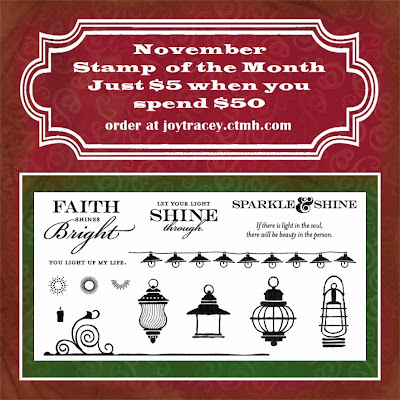 Winner will be announced on November 24, 2013 and has two weeks to claim prize. U.S. Residents only, please, over 18. Void where prohibited. 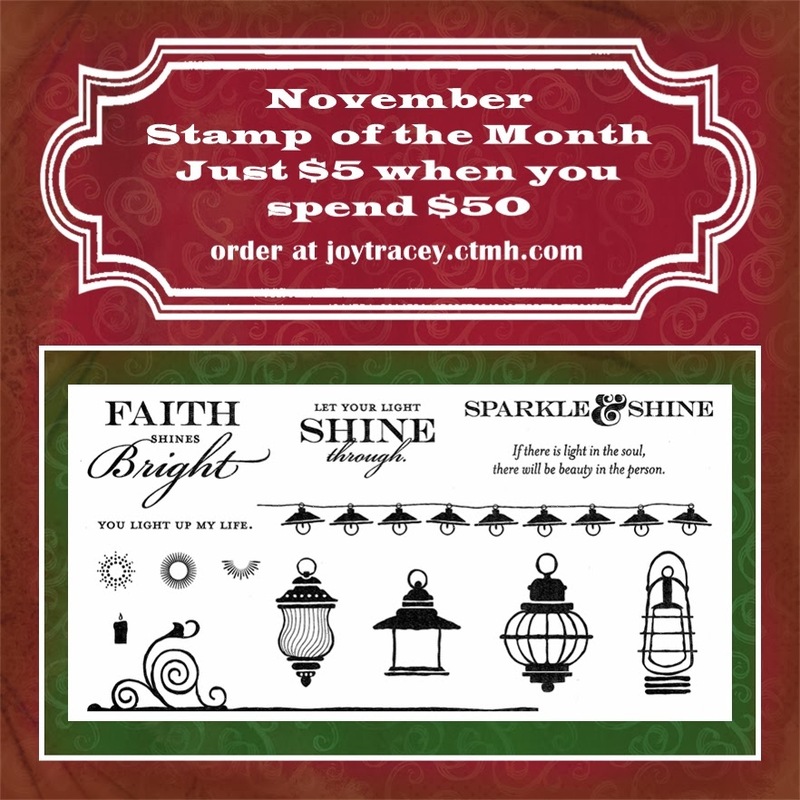 There's a new Close to My Heart stamp of the month - WOO HOO!! You can also download a PDF of the catalog HERE. Or I can send you one - just email me at joyster110@gmail.com with your address and I'll send one right out to you! Love the card and the video. Also love the cartridge that you are giving away. Love Anna Griffin. I've never made any moving cards, but I think I will make that for next year. Would love to win that cart. I don't see this in an email, but check your FB page daily. Oh this is soooo cool! I have never made this type of card, but have made moving cards in the past. Such a pretty card!! Love that you made a video of this. I've made one before in a class but never attempted another on my own. Your video will help make that possible. Thank you. I have made one before… they are so cool! TFS! Thanks for the chance to win! I have never made a moving card but would love to. Joy, this is adorable!!!!! Love it! I'll be giving this a try this weekend! Thanks for the inspiration. I have never made a double slider card but sure plan on doing one. I love cards that move and do fun things. Thanks for the great video! Happy Thanksgiving! I sure would like to win that cartridge! Thanks for the inspiration! I have never made a double slider card, thanks for the helpful video! I love watching all of them and I've learned so much from them, thanks. I may give it a try, if I can find the time! Great cards. Love the colors. Oh my gosh! This cartridge is so cute! I especially love the snow flakes. I live in Texas, so we don't get too many of those. I have to make my own. Thanks for the chance to win it! Love the card and thanks for the awesome video because it helps so much to see it in action. 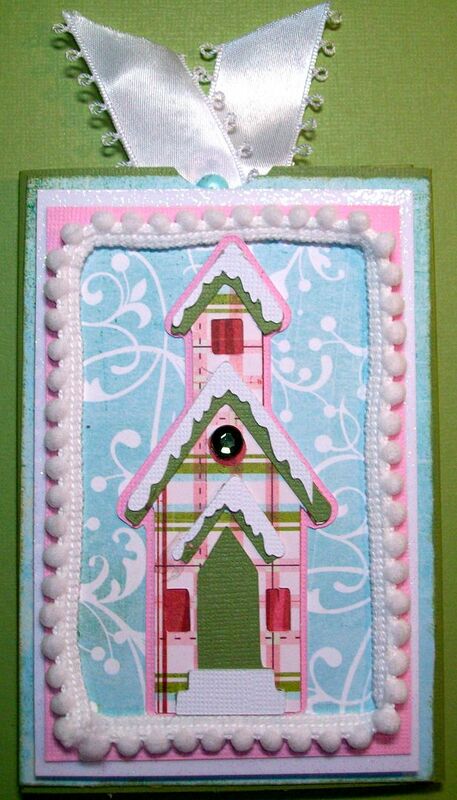 I made a double slider card years ago (had come across a tutorial), but it was the only one I have made. So thank you for the reminder about these fun cards! I do enjoy making moving cards, but usually don't take the time to do it! I have got to try this--never made a double slider card before!! I have made several interactive card before but not recently. Looking forward to trying this one. I have got to try this--never made a double slider card before!! I did make a pop up card after watching your video and love it. Thank you for all your videos they help so much. I did not know how to do that--usually fancy moving cards intimidate me, but that looks pretty easy to do! And so cute, I'm actually going to try it! PHYLLIS ANN R. FROM TEXAS no i have never done a slide card . but sure is a neat card . i will have to give it a try . thank you for the video that really helps. Thank you so much for taking the time to not only share, but to make your awesome video!!! :) I never even thought to make a double slider card (but I love making sliding cards and moving cards or unique cards in general)! Thanks for the tutorial. I struggle with making the really cool cards. Hopefully, I can make this one. I think it would be a nice change from the basic Christmas card. I love making cards that move! My grand kids love pop up cards. This will be a fun one. With a space to write a message. Thank you gor another fun card to make. I love interactive cards, but I haven't made this particular kind of slider card. I will now, though! You've inspired me! Thanks for another great card! Thanks for all the great ideas. Would love to win the cartridge. I love the double slider card idea! This looks like a great cartridge. I do not usually make movable cards but love what you did with this one. Thanks for a chance to win this beautiful cartridge. I had no idea how to do this. But, I'm off to try it now! Thanks for the video tutorial and the opportunity to win! I really love this "movable" card and thank you so much for all the instructions! You rock! Hoping to set out and make it! Thanks again for all your inspiration! Thanks so much for the video! I'm going to have to try making some of these cards. Like your card, never made one. Would like to win the cartridge. Love the slider card, may have to try that one out! Would love to own that cartidge, great images! Thanks for the chance to win! It's a beautiful card, but I'm not sure I'm willing to put that much effort into a card. I'd rather put that effort into a mini album or something more likely to be looked at over and over. Very cool--I have never made one of these. I love this project and am obsessed with that pom pom trim! Thanks for the chance to win! Beautiful card. I was not familiar with a moving card. I do more scrapbooking than card making, but could be fun to incorporate into a scrapbook page. Been meaning to try a slider card....now's the time to do it, huh? Love Anna's cartridge too....would absolutely love t o have that. Thanks!! Thank you for showing me how to make a slider card. I never tried making one, but I will now! I love the idea! I remember this from Christmas with the Cricut. That was one of the first slider cards I ever saw. Thanks again! I love moving cards, sometimes i make them, it's real fun!!! I also use them in a scrapbookpage so you can share more pictures. Your idea with teh christmascard is so beautiful I love it and i hope to win this cartridge! I did not kmow how to make a !ovimg card. Looks like a fun project. Just may give it a try for a special birthday card. I didn't know how to make a slider. I love your card and thanks for the video. I'll have to give it a try. I have never made a slider card. The video is very helpful. Thanks! Thanks for the great tutorial! I had no idea how to make this type card until I saw your video, but I hope to make one soon. 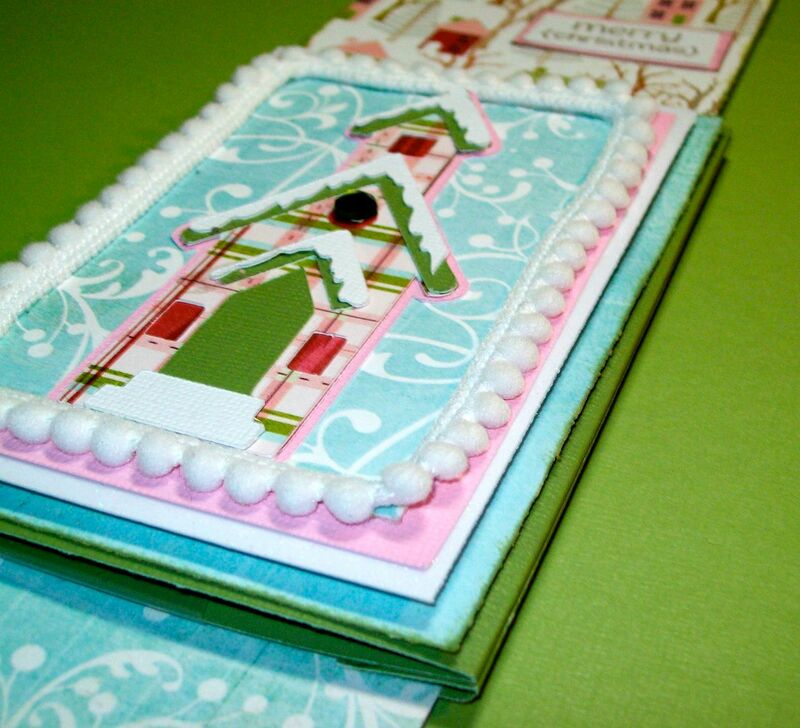 I have never made one but have seen them before and your card is absolutely gorgeous!! Will be looking at your video to see how to do it! No I didn't know how to do a slider card. Hopefully I will have time to try this out someday....looks pretty cool. thanks for idea. Will try it after Thanksgiving. As always, thanks for the chance to win a cart. No, I didn't know how to make a slider card. This is a great idea! I'll have to try this. Thanks for the video. Love the colors in the slider card and the cute pompoms too! What a great idea. I have not try making a slider card but I sure will try one. Thanks for the design idea. What a fantastic card & video! I am very new to the Cricut and cardmaking. Your video was very clear and I think I am going to attempt a double slider Christmas card myself. I had heard the term "slider card" before but your video & blog was the first time I had actually seen one. Thanks for the idea. I think I will make one for my niece. She likes receiving handmade cards and I think she would enjoy receiving one like this. Thanks! Your video made this card seem so easy that I will have to try it! I've never tried this so now I have to! Thanks for the tutorial. Very pretty, I love doing those slider cards. Beautiful card. I have never made a sliding card but I keep telling myself to give it a try. TFS! I didn't know how to make a slider card. What a great tutorial! It is so easy, I have to try it! Thanks again! I made a slider card one time at a class and loved it! Unfortunately, I lacked the confidence to try it again on my own...until now. Thanks so much! I've never made a slider card because they always looked difficult to make, but your video has inspired me to try and make one. 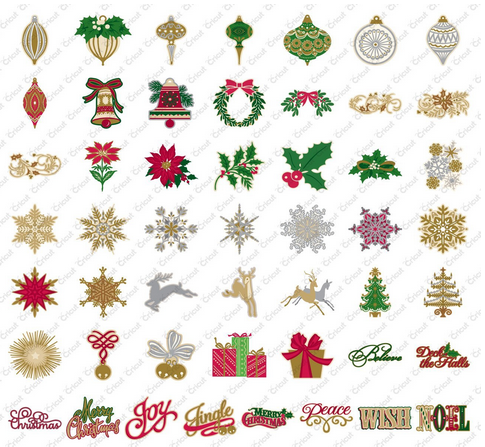 Love the Anna Griffin Winter Wonderland Cricut cartridge also - beautiful designs. Thanks. Thank you for tutorial on how to make this card. I am going to have to try it. I loved the paper you used on your card. Slider cards are really fun to make and the recipients love them since they are interactive and different. Thanks for the video and the chance to win this must have cartridge! I I LOVE it, Joy! You rock! Thanks for sharing this inspiring card! Love it. Thanks for the video. I will be trying this out. Yes, but I always love seeing how someone else does cards. Thanks for the video. i have recommended your blog to my Cricut class! How exciting! I would love to win the Winter Wonderland Cricut Cartridge. What a cool giveaway. Thanks for the video showing us this beautiful card. Thanks again. Love the Winter Wonderland Cart. Thanks for sharing how to make the slider cards. I haven't made a slider card yet, but I will now. Hope to win the Ann Griffin cart. Saw it last week on HSN. Beautiful! I've never made a double slider card. I have made a few moving cards though. I love the cuts on the Anna Griffith cartridge and would love to be your winner this week! Love the tutorial on the double slider. One of the paper companies sells them in a 4 pack, but now I can relearn to do it myself! Also, lovely cartridge by Anna Griffin. I can see so many uses! Have a wonderful week! I've seen the double slider card before but never attempted to make them...looked too complicated until now. Thanks for the video! Would LOVE LOVE LOVE to win the Anna Griffin cart! What a fun card & love the paper you used. Thanks for the video. I didn't know how to make this! What a wonderful card ^_^. Thanks for the video and the chance to win~! Moving/interactive cards are my favorite, but I've never seen the double slider before. Thanks for posting the tutorial and for a chance to win the cartridge. Being that I am a software engineer - loved the civil reference. I am just going to have to try this. - Melanie in PA.
Oooh, I think I know what I'm making for my grandsons! Love this card. Thank you, Joy. I have been a follower for some time now.... I just got some great things at HSN that were papers, bows, and emblishments that were Anna Griffin.... This would so go with the things that I have. Good Luck to everyone and thanks again for a chance to win. Love the card. Oh, I remember this video and card but I am still going to watch it again! I have made cocoa sliders and another mini-slider called a wiper card and I LOVE anything interactive. Your double slider card is not only cute, it's genius in ho it works! Happy Thanksgiving. Hope you have a great day. I have never made a slider card, it looks so fun. I am going to make it soon. Cards are my favorite craft to do. My cricut is my best friend. It stays in the dining room so when I want it here it is. Thank you for all of your ideas and information. This is the best site I have been at. I love the card, it is adorable!! I love the Cart by Anna Griffin! I am new to creating cards and just got my Cricut, so I would be thrilled to win the cart! I have never made a sliding card, but I think I am going to have to give it a try! Thank you so very much for the chance to win!